met with children near Balad in Iraq. Army Reserve Maj. Major Hallah Nilsen, civil-military operations officer for Hawaii 29th Brigade Combat Team's 29th Support Battalion, writes that members of her unit -- the 100th Battalion, 442nd Infantry -- helped provide security for the Oct. 15 Iraqi constitutional referendum. The soldiers provided security for the Hawaii Army National Guard's 227th Engineer Company, a unit assigned to 29th Brigade Combat Team, as they placed concrete barriers and concertina wire at the polling sites. Nilsen said soldiers of the 100th Battalion also were prepared to assist the Iraqi Security Forces during the election if needed. After the election, Capt. Timothy McGrew, civil-military operations officer for the 100th Battalion, organized delivery of school supplies to schools used as polling sites to thank staff and students. "The schools' participation in the election process was instrumental in showing support to their country and its new government," Nilsen said. McGrew said the experience was rewarding because "I enjoy seeing the excitement in the children's eyes when they receive gifts from the Americans." At a village near Balad, McGrew and Nilsen met with the school superintendent, who requested supplies for all three village schools. They visited a primary school for girls and boys, a secondary school for boys and a secondary school for girls with an attached early-childhood school. "During our tour of the school, the school principal and teachers eagerly shared the needs of their school, hoping that we could help them," Nilsen said. After returning to nearby Logistical Support Area Anaconda, Nilsen -- who was an early-childhood teacher before being mobilized last year -- prepared a slide presentation on the school's needs and disseminated it to her family and friends. McGrew, Nilsen and the soldiers of the 100th Battalion visited another school northeast of Anaconda. About 400 boys and 200 girls have to attend classes in shifts because of damage caused by bomb attacks during the January elections. 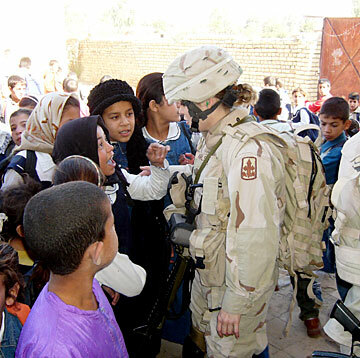 When they arrived, the soldiers were swarmed by children wanting to take pictures and talk. Nilsen remembers one teenage boy saying to her, "I love you." He also asked to use her camera, and the resulting photos became her favorites from the school visit. The battleship USS Missouri, berthed at Pearl Harbor, has a new armament exhibit valued at $100,000, featuring four Desert Storm-era Harpoon missile launcher canisters. The launchers were donated by the Boeing Co. Before the Missouri's second commissioning in 1986, the ship was upgraded and equipped with 16 anti-ship Harpoon missiles. The Missouri's armament also included nine .50-caliber guns, 12 .38-caliber guns, 32 Tomahawk missiles and four 20mm Phalanx Gatling-type guns. The installation of the Harpoon canisters was also made possible by Naval Air Systems Command and $25,000 worth of services and equipment donated by Hawaii Crane & Rigging Ltd. to help lift the canisters into place.